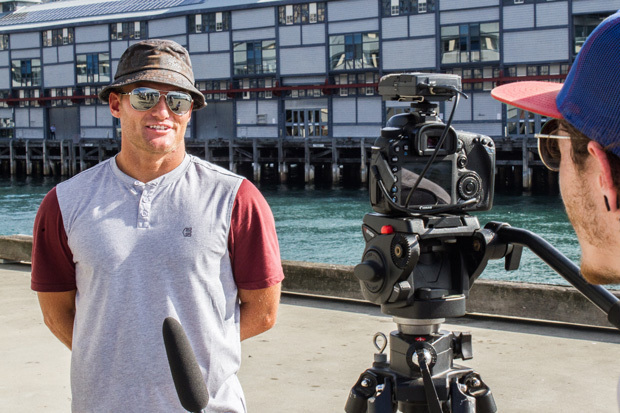 It’s not often you find a couple of legendary snowboarders like JP Walker and Scott Stevens roaming the streets of Sydney. But that’s exactly what happened earlier this month when we linked up with the duo during their quick-fire Australian tour to promote 2032, the new full-length team movie from ThirtyTwo. Despite an obvious lack of snow on Australia’s East Coast, the boys still managed to get their shred on – albeit on a different kind of board. Australia has managed to consistently lure some of the world’s best snowboarders to its shores over the last few years, but for Scott and JP Australia is still very much a foreign entity. Scott’s only previous visit to Australia was a year ago, on another similarly brief stop, while JP hadn’t hit our shores in around a decade. With that being the case, the boys were keen to check out some of the sights — but not before a stop at Waterloo Skatepark. The unbelievable energy Scott and JP harvest is apparent when watching them snowboard, but we didn’t expect them to hop straight off a flight and immediately begin throwing down tricks on a skateboard. 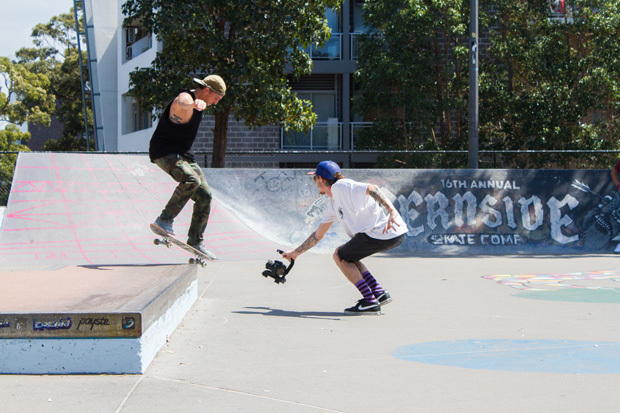 That’s exactly what they did, though, and before much time had passed, each of them was delivering hammers back-to-back at Sydney’s finest inner-city skatepark. If you’ve never seen these guys skateboard before, then let it be known that neither of them are slouches on four wheels. 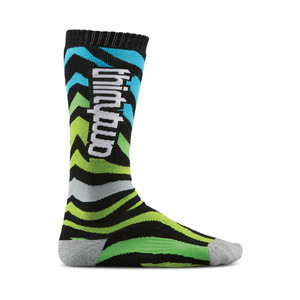 They each have their own distinct style and tricks, and they spent a lot of time skateboarding between snow seasons. That’s obviously apparent in the above video. Scott in particular is capable of throwing down some mind-boggling skate tricks, definitely reminiscent of his creative bursts on a snowboard. From unbelievable no-comply combos to mind-boggling ledge tricks never previously witnessed, it’s pretty apparent that Scott could have been a pro skateboarder if things had turned out differently. Scott is a skate rat through and through — his only tattoo is a Thrasher Skate and Destroy piece under his ribcage — so it came as a surprise when he mentioned that barely anyone films or photographs him skateboarding. While Scott held down the creative mind-benders, JP toiled away on some difficult flip and ledge tricks in the streets and park throughout the weekend. JP has nollie backside flips and varial heelflips dialed, as well as switch frontside boardslides, and any skateboarder knows how difficult those can be. He also went back-to-back on a frontside half-cab flip and a fakie bigspin heelflip on flat, to further prove that at 38 years of age, he’s still got it on both a snowboard and skateboard. These guys were on a jam-packed tour schedule, and the fact they were able to energetically skate for the best part of an entire weekend, in between premieres and parties no less, is a testament to how professional and committed the two of them are. 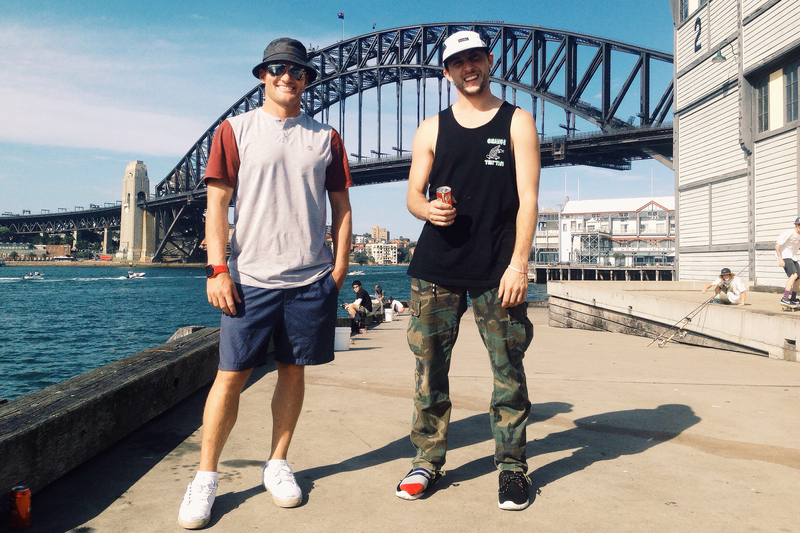 We took the boys for a little trip around to some city sights — the Sydney Harbour Bridge, Circular Quay, the Opera House and Manly Beach to name a few — and even managed to get in a few flatground skate sessions with famous backdrops before the springtime rain set in over Sydney. 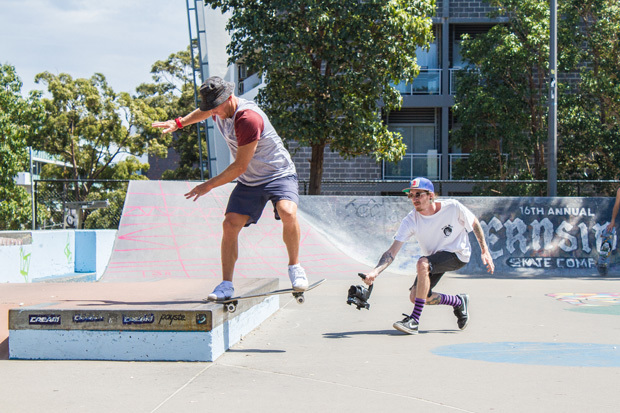 Even with the Sydney Opera House within touching distance, the boys were still more focused on stomping skate tricks. The amount of concentration and skill on display showed us exactly why Scott and JP have been elite snowboarders for so many years, and neither of them were ever pleased with the tricks they landed, despite how perfect they were. Scott and JP are their own harshest critics, and watching them invest so much effort into a hobby like skateboarding makes you appreciate how much effort must be poured into their actual job, snowboarding. That commitment certainly showed when it was time for the Sydney premiere of 2032 later that night, which both Scott and JP starred in. This was JP’s 20th professional video part, which is an insane feat, and after hanging out with him for two days it was clear that this guy deserves everything he’s got. Scott had the final part in the movie, and he stepped up his game with some absolutely surreal tricks. Scott’s snowboarding might occasionally seem ad-libbed in a sense, but after watching his creative mind at work on a skateboard, it’s clear exactly how much effort goes into inventing his snowboarding tricks. Both of them killed it, and no one was surprised. If you want to watch a great snowboarding film, grab a copy of 2032 on DVD or Blu-ray In terms of production quality, 2032 is second-to-none. Combine that with a slew of full parts from an unbelievable lineup of riders including: Scott, JP, Chris Grenier, Joe Sexton, Chris Bradshaw, Frank April, Dylan Thompson, Brandon Hobush and many more, and you've got yourself one of the best snowboarding films in recent memory. As always, you can purchase the DVD or limited edition Blu-ray in the Boardworld Store. The limited edition Blu-ray comes complete with an additional standard DVD, and a 48-page book documenting the film. The tour ended as quickly as it began, though, and it was soon time for the boys to pack up and head to China for more premiere duties. The two days we spent with these legends were more epic than we could have ever imagined. Scott and JP are two of the friendliest and most professional people we've ever met, and watching them excel at skateboarding became less surprising we quickly began to understand why these guys have been killing it for so long. Above all, though, the two of them continued to emit that unstoppable energy that first surprised us when we met them at Waterloo Skatepark. That’s what it’s all about. Cheers for an epic weekend, boys. Let’s do it again sometime.